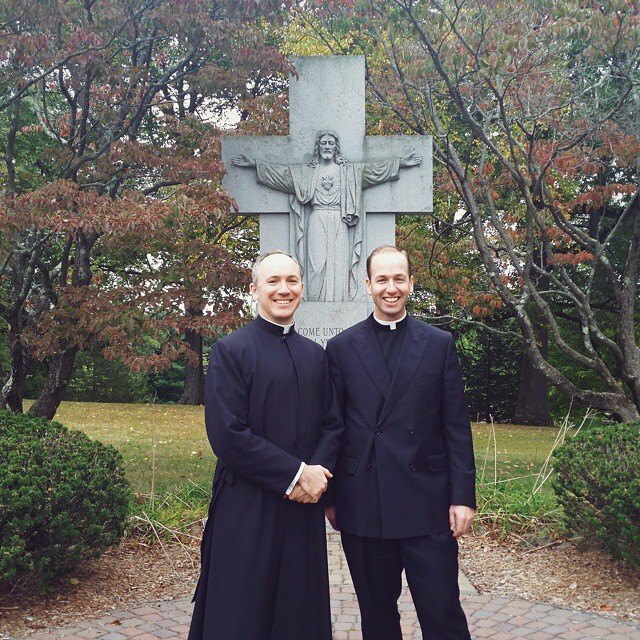 Fr Jason Smith is a priest with the Legionaries of Christ residing in New York. Ordained in 2006, he spent the first years of his priesthood dedicated to youth work. Currently he is chaplain to the Regnum Christi Movement in the Tri-State area and assists on Tuesdays at Resurrection parish in Rye, NY and on Sundays at Saint Patrick’s Old Cathedral in Manhattan. He helps preach the Hope and Healing retreats with the Sisters of Life and is chaplain for the upcoming Way of Beauty course at the Theology of the Body Institute. He enjoys bacon, art, baseball, photography, and strong coffee, all in that order, except strong coffee is first. His younger brother, in the photo above (the one with more hair) is also a priest with the Legionaries of Christ. Fr Jason, I am Gloria Chiesi, from Roma, Italy. You again touched my heart by comparing my “impatience” to God’s being like “good wine”….We must wait for it to be “ready”… I stopped asking, Father. I just thank the Lord for something we take so much for granted: HEALTHY….Healthy body, healthy mind. And that’s what I try to transmit to those who “train with me” . I don’t want to bore you. Would love to have you and your brother at my home (29 Deer Run Trail Sherman, Ct 06784- ) and I WILL DEFINITELY INCLUDE BACON AND ESPRESSO IN MY MENU. I don’t mind boosting about my cooking. I love cooking and all of you men and women, especially priests, appreciate good food. Jesus would have loved my food. BUONA PASQUA!!! HAPPY EASTER and please tell your mother, father, whatever family you have that you and your brother are DREAMS COME TRUE, for any parent. ARRIVEDERCI!!! and may God keep you in the palm of HIS hand.